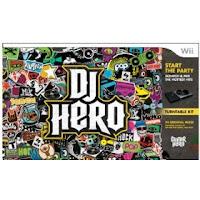 The new DJ Hero Video Game is now available and is a very popular game already. This game is similar to Guitar Hero (created by the same company) and allows you to use a turntable/mixer controller to scratch and mix your way to the top. DJ Hero is also compatible with the Guitar Hero Controller, so in multi-player mode, you can compete with your friends as DJ vs. DJ or DJ and Guitar. There are more than 100 songs from a variety of music styles including Pop, grunge, R&B;, Soul, techno and hip hop. If you are interested in DJ Hero, you may also want to check out The Beatles Rock Band Video Game.